Before it began its fourth season, Music From Japan presented music on the radio for the first time. On June 28th MFJ presented the program, “Artists in Concert” on WQXR, which featured three Japanese works for string quartet by Teizo Matsumura, Joji Yuasa, and Ichiro Higo. The pieces were performed by the world renowned Kronos Quartet. For Music From Japan’s Fourth Season in New York, they offered three programs at three locations: Carnegie Hall, St. Luke’s Church, and the Lincoln Center Library. The first program, which took place on October 2nd 1978, consisted of six American premieres with pieces composed by Kenjiro Urata, Maki Ishii, Joji Yuasa, Norio Fukushi, Motohiko Adachi, and Izumi Yamada. 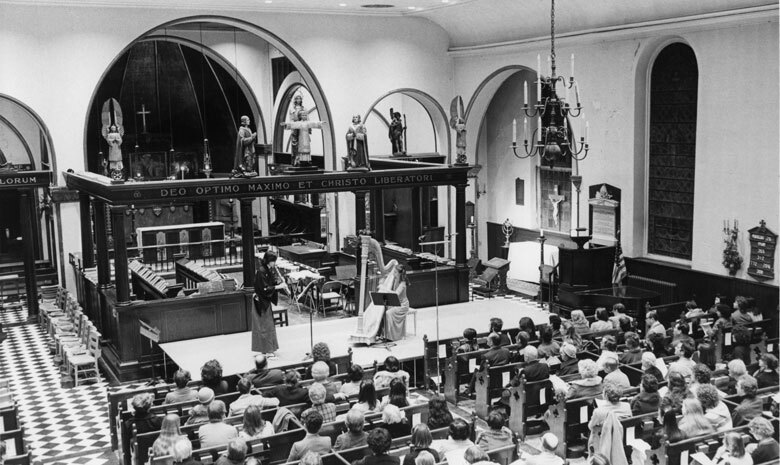 On November 12th 1978 at St. Luke’s Church, for the first time Music From Japan presented music that incorporated traditional Japanese instruments. The pieces represented an exploration and discovery of how the instruments from the two worlds can find points of contact and cooperation. The works performed were: The Japanese Dances for shakuhachi and harp by Tokuro Furuta; Reflection for shakuhachi, koto, and cello by Teruyuki Noda; Okaru-Kanpei by Yasuo Sueyoshi; Jo Ha Kyu for two shakuhachis, by Shinichi Yuize; and One Movement for koto and string orchestra by Ichiro Higo. The final New York concert of the fourth season, which took place at the Bruno Walter Auditorium at Lincoln Center on January 2nd, 1979, was a retrospective: highlights of previous seasons were presented alongside several new compositions. The composers featured were Yoshiro Irino, Sesshu Kai, Toru Takemitsu, Jo Kondo, Norio Fukushi, and Teizo Matsumura. To conclude the Fourth Season Music From Japan put together a concert at the Kennedy Center in Washington D.C on February 1st 1979. Once again, Mr. Miura organized a program of Japanese works performed by leading American musicians. Teizo Matsumura, Jo Kondo, Teruyuki Noda, Kazuo Fukushiima, Norio Fukushi, and Yasuo Sueyoshi all presented Washington D.C. premieres.